The story will be different for each family. This could be the beginning for you, the very first family dinner ever. Or it could be about sticking to a routine, providing consistency in your day. Or maybe it is about forming new traditions that are unique to your family. No matter what your story is, you’ll begin the same way. Start with one dinner and one conversation. You’re going to eat anyway, right? So while you do, take some time to discover what family dinner means to you and what it could become. Have dinner together. It can be a home-cooked meal around a candle-lit table or take-out at a picnic table. Begin to talk about family dinner and about why you want to try “Food, Fun and Conversation” with your family. One option is for each family member who is old enough to fill one out before dinner. Then, each family member can share their responses at the dinner table using this fun activity. Another option is to take turns sharing your goals during dinner, and then fill out a single Goal Sheet as a family after dinner. Don’t think a Goal Sheet will go over well in your family? No problem. Try our “stealth plan” instead. As family dinner takes shape for you, look to our tools and resources for inspiration, and write to us with other questions. No matter what your challenges are – time, money, tension at the table – we have ideas. And remember, this program is about real life, not perfection. Think back to a family dinner that was really satisfying. Different people may have different examples. What made those dinners mean so much? Where were you? What were you eating? What were you talking about? 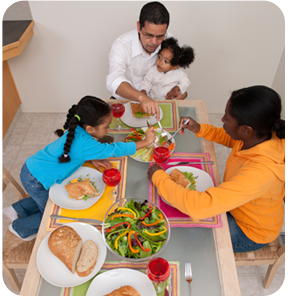 What is an ideal family dinner for your family? What would be different if you had family dinners more often? At the end of the conversation, celebrate as a family! What do you do to celebrate in your family? What is a special treat for everybody? Do a funky dance, have sprinkles on your ice cream. Notice how much this one family dinner has meant. And if it didn’t work so well, celebrate anyway – you made a first step. This is what it’s about: food, fun and conversation about things that matter. You already know what you’re doing. This is your story, and like any good story, it gets better as it goes along.